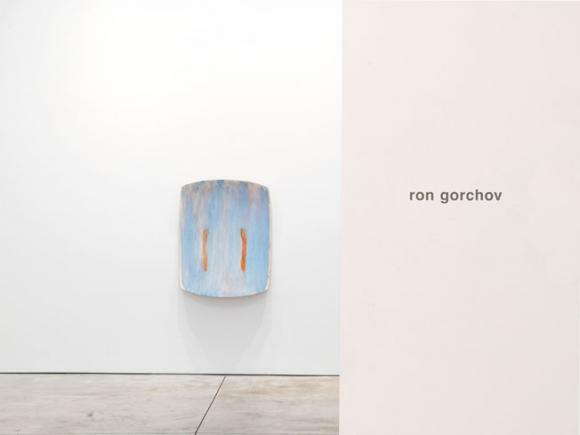 Cheim & Read is pleased to announce an exhibition of recent paintings by Ron Gorchov, curated by Phong Bui. Born in Chicago in 1930, Ron Gorchov has lived and worked in New York City since the early 1950s. Following a first solo show at New York’s Tibor de Nagy Gallery in 1960, Gorchov has since exhibited at The Museum of Modern Art, Whitney Museum of American Art, P.S.1., Queens Museum of Art, New Museum of Contemporary Art, and Centro Atlántico de Arte Moderno, among other institutions. Gorchov’s distinctive and assertive saddle-like stretchers were created in the late 1960s as an alternative to the pervasive Greenbergian formalism of the time, evidenced in the dominance of minimalist sculpture. The stretchers offered a foil to the novel images, as yet seldom seen in contemporary painting. The nuances generated by Gorchov’s concave and convex forms, his surface’s sensual touch, and his restrained composition work in concert to elucidate the viewing experience. For example, the stretched linen attached by exposed staples, which tenuously wraps around the frame’s edge draws attention to the tension between surface and structure. Furthermore, it persuades the viewer to peer around and inspect the back of the frame. This invites a comparison between the rawness and angularity of the wood structures held together by fasteners and the feebleness of the images unified by painterly strokes and drips of vivid washes. With assured wit and mediation, Gorchov embraces the undefined, either formally or intuitively his approach that allows for constant shifts in the orientation and dimension of the canvases. But by using contrasting elements to both complement and question each other, Gorchov reaches equilibrium with aplomb. It is this duality—image and structure—that informs Gorchov’s gestural language. Responding to the predetermined construction of the object, Gorchov layers, patches, drips, and rubs away both vivid and muted tones. He creates an unstable space and unpredictable surface of gestural signifiers, commonly two irregular forms that face one another, which immediately converse with the frame’s sturdy character. This dialogue alludes to sensations or ideas addressed in his exacting titles, such as “Noli Me Tangere” (2011) and “Chase Street Lounge” (2011), which derive from mythology, religion, or pop culture. Gorchov’s forms are variable: they differ in their position on the surface, their angle to the stretchers, their shapes, and their relationship to one another ; one constant is that they are always personified. The negative space between forms also assumes a significant role as the stretchers’ bellowed-out and curved-in edges acts with the forms to compress or expand the central field. In his stack paintings, however, rather than project associations, Gorchov simplifies the relationship between surface and structure in regard to a formal reading, and alters the height of each monochromatic panel so that viewers read each color in equal increments. In reflection of Gorchov’s work, this exhibition offers a spare collection of paintings that is simultaneously austere and legible and ultimately balanced so that the vigorous structures and the delicate surfaces are in perfect harmony.